At the close of Monday night’s games, the Del Sol, Boulder City and Democracy Prep boys basketball teams combined sported a 34-14 record. So it should not have come as a surprise that Pahrump Valley would struggle during a three-game stretch against them. Horace Langford Jr./Pahrump Valley Times Pahrump Valley senior Eric Toomer gets double-teamed by Boulder City defenders during Friday night's game in Pahrump. Horace Langford Jr./Pahrump Valley Times Senior Ethan Whittle goes up for a layup for Pahrump Valley as teammates Koby Lindberg (22) and Chance Farnsworth (12) follow the play Friday night against Boulder City. Horace Langford Jr./Pahrump Valley Times Pahrump Valley players, from left, Logan Gavenda, Koby Lindberg, Garrett Ward, Ethan Whittle and Brayden Severt listen to an animated coach Dan Clift during their Friday night game against Boulder City in Pahrump. But that didn’t make Friday night’s beating at the hands of Boulder City any easier to watch. 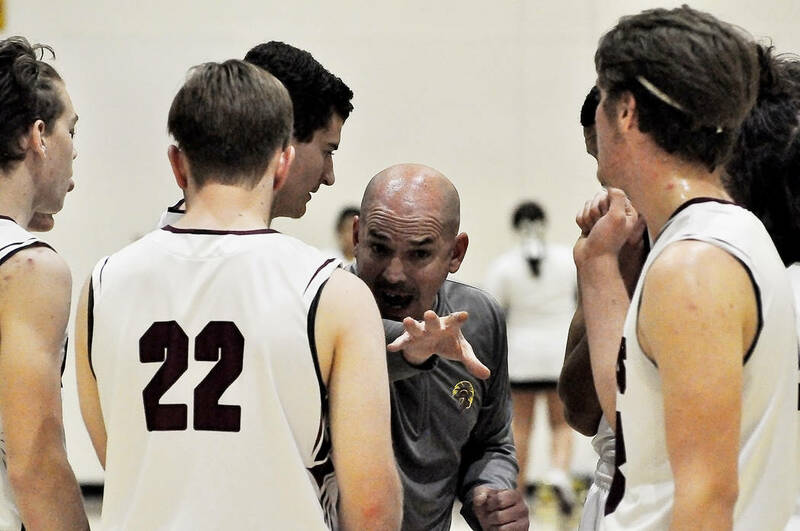 The Eagles exploded for 29 points during the second quarter, turning what was a 10-7 game late in the first into a 41-13 halftime lead on their way to a 57-19 rout in Pahrump. 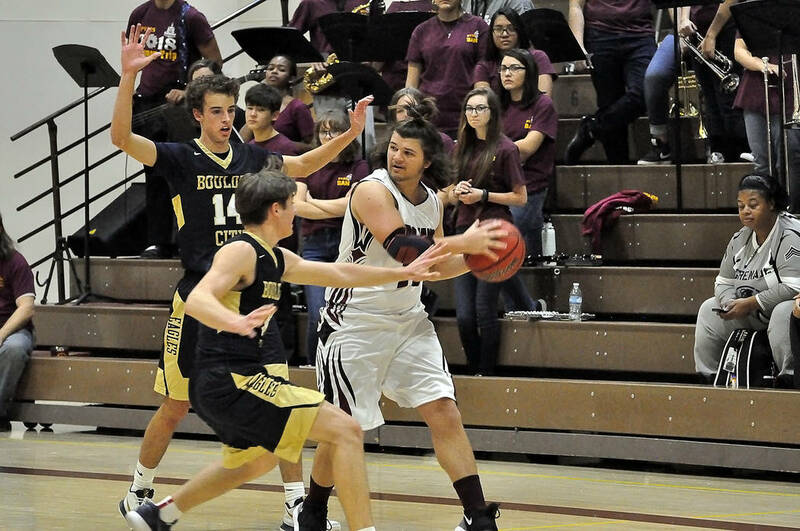 Boulder City scored 27 consecutive points over a seven-and-a-half-minute span bridging the second and third quarters in a solid display of pressure defense and textbook fast-break offense. Time after time the Eagles tipped Trojan passes, pushed the ball ahead and scored easy baskets. And when 6-foot-6 sophomore Ethan Speaker dunked ahead of the field after yet another Eagle steal with 5:46 to go in the third quarter, the lead was 49-13 and the running clock was in effect. Three players scored in double-figures for the Eagles, led by Derrick Thomas’ 16 points. Karson Bailey netted 13, while Matt Morton added 10. 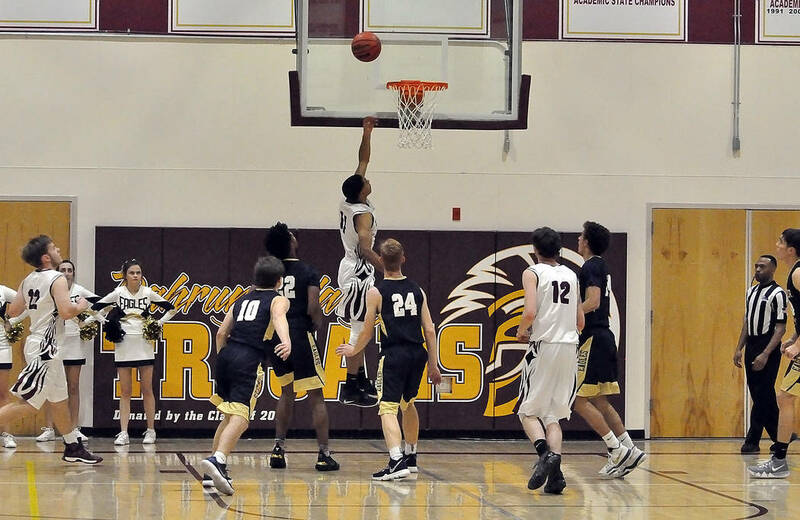 Senior forward Brayden Severt was Pahrump Valley’s leading scorer with 10 points. One night earlier, the Trojans went back into Sunset League play, traveling to Las Vegas to take on Del Sol. The Dragons dominated early, taking a 24-9 lead after the first quarter and coasting to a 71-48 victory. Four players scored in double-figures for the Dragons, who built a 63-31 lead after three quarters. Del Sol’s Donald Campbell and Pahrump Valley’s Grant Odegard each scored 17 points. Against Democracy Prep on Monday night, it was over early as the Blue Knights took a 30-5 lead after one quarter, went up 66-16 after three quarters and cruised to a 70-21 win. Najeeb Muhammad led all scorers with 19 points, while Severt led the Trojans with nine points. Now on a four-game losing streak, the Trojans are 4-12 overall and 0-3 in the Sunset, tied for last place in the league with Western. Those two teams will get together for the first of two meetings at 6:30 p.m. tonight in Las Vegas.